BUCYRUS — Cody Redmond, 26, of Bucyrus, found guilty of forgery, was sentenced to five months in jail Tuesday. He was accused of buying at TV at Walmart in Bucyrus with counterfeit $20 bills. 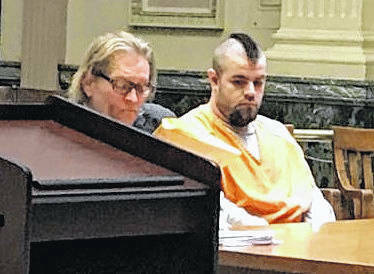 Assistant Crawford County Prosecutor Ryan Hoovler argued that Redmond doesn’t understand the gravity of his behavior, before asking Common Pleas Judge Sean Leuthold to imposed a nine-month sentence. Tom Nicholson, Redmond’s attorney, made several points on Redmond’s behalf. “Mr. Redmond has a strong family. He is below average on the intelligence scale and spent his time in school in special classes. He has no prior adult felonies, this was not a violent crime and he feels he can be successful on the probation program,” Nicholson said. That statement didn’t sit well with Leuthold. Leuthold went on to explain that he did not believe that Redmond had learning disabilities. In fact, he said Redmond was smart. Leuthold told Redmond he’d give him one more chance to come clean before he handed down the sentence. Redmond then admitted that he got the money from a man in Marion who told him how to pass the fake money. Leuthold decided to give Redmond a flat jail sentence and not place him on community control. Because Redmond lied on the stand, Leuthold sentenced him to five months in the Crawford County Justice Center, with credit for time served. Also in court this week were several bond hearings. Joseph Wagner, 28, of Bucyrus, was arraigned on a charge of violating the conditions of his community control. Wagner was on judicial release from a felonious assault charge in 2016. According to the allegations, Wagner stole a bottle of Rich and Rare Liquor from Erhart’s Drive Thru and Party Store on March 13 and drank it. Referencing the seriousness of the original conviction for felonious assault, Judge Sean Leuthold set Wagner’s bail at $100,000. The court also appointed Adam Stone to again represent Wagner. Chad Fromm, 23, of Shelby, was accused of committing a community control violation. According to probation officer Mark Alspach, Fromm failed to report his address and failed to report for ordered office visits with his probation officer. A not guilty plea was entered by the court and attorney Tom Nicholson was appointed to represent Fromm. Bond was set at $50,000. Jordon Gibson, 20, of Bucyrus, was charged with a two-count indictment. He is accused of breaking and entering and vandalism that took place on March 23. Gibson is accused of breaking into a rental property on South Poplar Street Gibson was said to be angry with the owner for refusing to rent the dwelling to a relative. Gibson then allegedly broke into the residence and poured bleach throughout the house and broke windows. Leuthold set bond at $75,000 and appointed attorney Andy Motter to represent Gibson. David Brocklesby, 53, of Bucyrus, was charged with three counts of possession of drugs including OxyContin, Diazepam and Sub Oxone. Leuthold entered a not guilty plea on Brocklesby’s behalf and appointed attorney Brian Gernert to represent him. Bond was set at $25,000. Jennifer Smith, 32, of Crestline, was charged with violating the terms and conditions of her probation. Smith was on community control following a 2017 conviction of a burglary charge. According to probation officer Eric Bohach, on April 15, in Crestline, Smith committed domestic violence and on that same day refused to submit to a drug test when requested by her probation officer. Citing the seriousness of her original charge, Leuthold set bond at $100,000 and appointed attorney Brian Gernert to represent her. Mathew McGlothlin, 36, of Galion, is accused of possession of drugs, obstructing official business, possession of drug paraphernalia and a minor misdemeanor of drug possession. Attorney Patrick Murphy successfully argued the merits of a personal recognizance bond for his client. Murphy noted that his client had a job and a family to support. He also noted that McGlothlin has lived in Galion his entire life and has a child with special needs to help care for. Leuthold granted Murphy’s request with conditions. McGlothlin must report every day to probation officer Eric Bohach for a drug test.